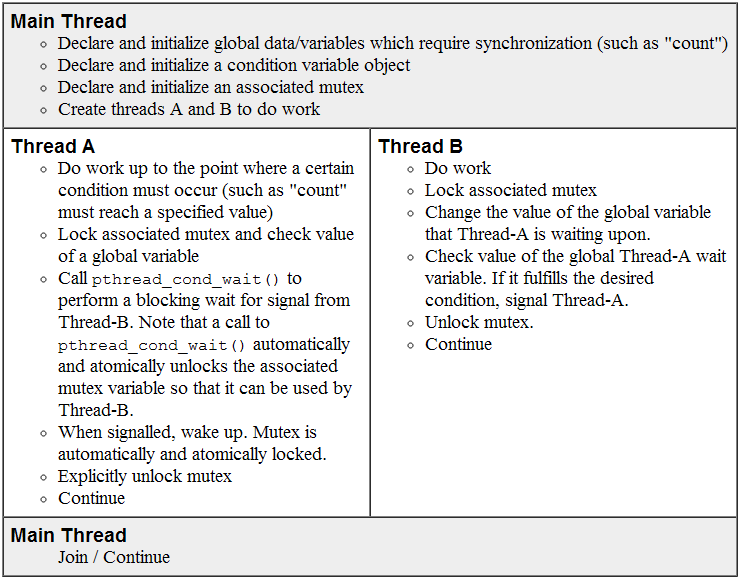 While mutexes implement synchronization by controlling thread access to data, condition variables allow threads to synchronize based upon the actual value of data. A condition variable is always used in conjunction with a mutex lock. And a representative sequence for using condition variables is shown below. pthread_cond_wait unlocks the mutex so another thread can have the chance to signal the condition variable. Ah, UNIX stuff. Essentially you would create a function to alternate between persistant thread states, set lock and start/wakeup/sleep conditions plus a counter. At first, only one persistent thread (say t1) can lock LOCK, so t2 waits. t1 then fulfills the condition (COUNTER++) but waits. Since the main thread sleeps once it lets persistent threads go, so only the other persistent thread (t2) can be waken up (one switching). t2 signals CONDITION, but t1 cannot wait right now because t2 holds LOCK, and t1’s wait invocation have to wait until t2 unlocks LOCK. Therefore, t2 goes on increase COUNTER and waits. Since the wait invocation unlocks LOCK, so t1 now wakes up and signals CONDITION. Similarly, t2 cannot wake up right now but has to wait until t1 increase COUNTER and actively waits again. Why Go? Use Racket!In "C++"
Yi Wang’s Tech Notes, I just actually had been seeking for something similar and was thrilled to obtain the advice through this particular content. info written in such an ideal means? I’ve a challenge that I am simply now operating on, and I’ve been on the look out for such information.